Nanoparticles in the form of dendrimers (highly symmetrical, branched molecules) may prove useful in delivering a variety of advanced contrasting agents and therapeutics to specific tumor targets. This image shows brain tissue from a rat that had been treated with tumor-targeting dendrimer-based nanoparticles (red). 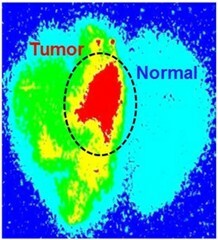 The nanoparticles penetrated the blood-brain barrier and were selectively taken up by the tumor and not by the normal brain tissue.